Profitable Trading Strategy is trend following but is also based on the I-regression. Unpack the rar ProfitableStrategy file. 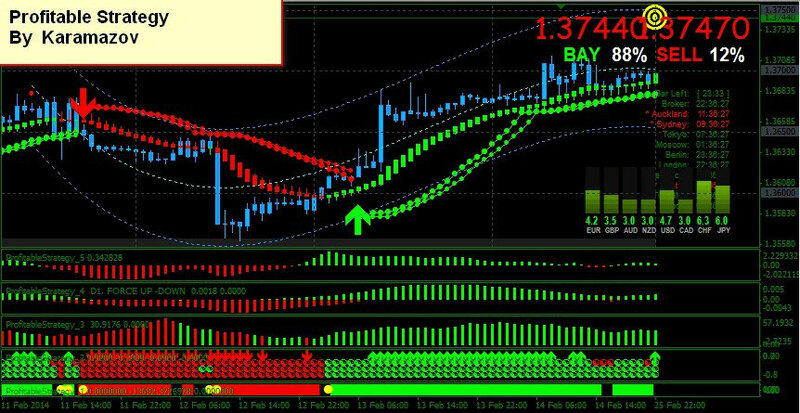 Copy all indicators in the folder ProfitableStrategy and paste it to your metaTrader folder C:\Program Files\MetaTrader\experts\indicators. Copy the template of ProfitableStrategy , and put it in the C:\Program Files\MetaTrader \ templates.4. Restart MetaTrader 4. After restarted MetaTrader 4,click template menu, load ProfitableStrategy template. Wait for a while until the strategy is fully loaded. Trading strategy is ready to work. Now we need to find a point of entry into the market, beginning with the timeframes: "M30--H1"
The Best trading pairs: "EURUSD", "GBPUSD", "AUDUSD", "USDJPY", "USDCHF", "USDCAD", "EURAUD", "NZDUSD". This Strategy indicator gives very good signals for BUY and SELL. When you see all the color change from RED to GREEN, is time to enter market to BUY up. When you see all the color change from GREEN to RED, is time to enter market to SELL down. On every currency pairs, you can determine which pair of currency is going UPor DOWN. .Trend indicator for determining the strength or direction of movement BUY or SELL. Indicator trading timer, which are displayed flushes on schedule time: the beginning and end of all trading sessions. This indicator displays on the chart levels: support and resistance. The thicker the line, the harder it is to break. Not a bad system, except the round no. indictor compresses on jpy pairs. Might be it was made for 4digit brokers.